This single cut-away guitar, with a beautifully carved South American mahogany body and quarter-sawn, flamed maple neck, with a 12" radius maple fingerboard, is an instrument with a truly great vibe. The Seymour Duncan STR1 neck pickup and STL1 bridge pickup deliver warm vintage tones, with lots of sustain. The neck starts with a soft "V" at the first fret and gradually becomes a large "C" from the 12th fret right on to the heel. This one is a real "show-stopper", but don't take my word for it. Click on the icon at the bottom of the page for a close-up view of the JXJ and judge for yourself. 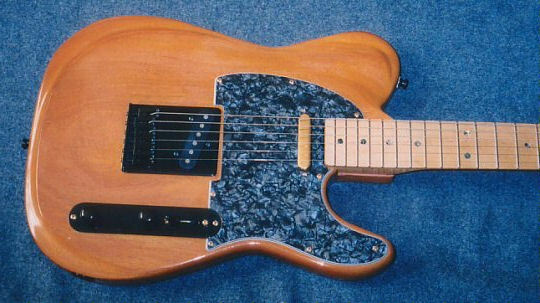 One-piece mahogany body, beautifully carved top and back. Special V-shaped neck, bolt-on, highly figured maple, oil finished, and reinforced with 2-way adjustable truss rod. 21 or 22 high quality jumbo frets. Seymour Duncan STR-1 single-coil rhythm STL-1 single-coil lead pickups. Master volume control, tone and 3-way pickup selector. Available colours are transparent golden brown or deep amber.